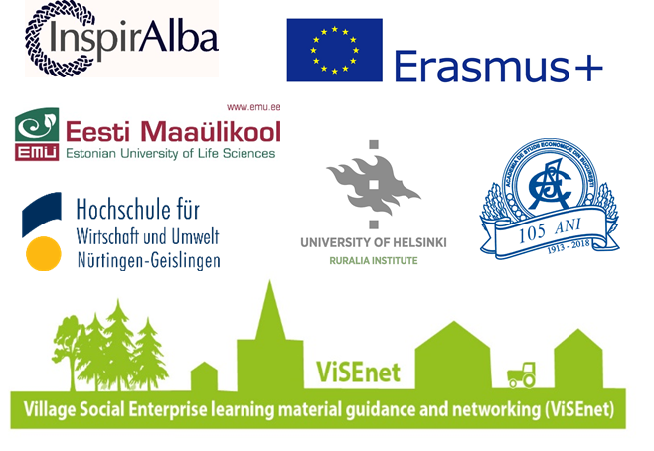 Erasmus has launched a new project, 'Visual Social Enterprise (ViSEnet)', which will share learning material, guidance and networking opportunities to promote social entrepreneurship in rural areas. Across many countries, rural areas are facing similar challenges, such as diminishing local services, economic and employment issues, as well as demographic changes with increasing older population and out migration of young people. There is a need to find new tools to assist rural communities to address these challenges and ensure sustainability. This approach to sustaining services is well established in Scotland (and particularly rural Scotland). The 2017 Social Enterprise Census for Scotland demonstrates the significance of Social Enterprise in the rural context with 34% of Scotland’s social enterprises being based in a rural area, despite hosting only 18% of the nation’s population. This is particularly relevant in Argyll and Bute, one of the top 3 local authority areas with the lowest population densities and highest density of social enterprise per capita. However much of the learning resources, guidance and networking for ‘social enterprise’ and ‘community development’ has evolved from an urban perspective. "Examples from Social Enterprise and Community Enterprise from across Scotland demonstrates a wealth of local potential, knowledge and skill for sustaining services and enhancing community life using an enterprise approach, explains Ailsa Clark, Development Manager for Argyll based social enterprise InspirAlba. The concept is, however, relatively novel in rural development across much of Europe. ‘This is why there is a need to develop tools, resources, guidance and networking, bringing together examples of good practice in relation to rural social enterprise to assist local people across Europe to develop knowledge and skills. This would include rural community involvement, partnerships and networking, business thinking and recognising the potential of social entrepreneurship in sustaining rural communities’. explains project assistant Rachael Robinson. The project is aimed at individuals who are interested in developing and sustaining their rural communities, who are willing to consider socially enterprising solutions to assist their rural areas or individuals whoalready have an idea for social enterprise in rural areas, as well as individuals already engaged in social enterprise activity but wish to gain new skills, knowledge and expertise to assist them in their venture. The target groups of the project are individuals who are interested in developing and sustaining their rural communities, who are willing to consider socially enterprising solutions to assist their rural areas or individuals who already have an idea for social enterprise in rural areas, as well as individuals already engaged in social enterprise activity but wish to gain new skills, knowledge and expertise to assist them in their venture. Nearly 300 participants will be engaged in learning while participating in the actions of the project. enhancing the rural communities to better interact and exchange experiences and good practices with other communities regionally, nationally and internationally by a digital networking platform as well as by establishing an international network of rural social enterprises to exchange experiences, good practices and disseminate learning material created. Nearly 300 participants will be engaged in learning while participating in the actions of the project.